“Legacy,” the Winter Dance Concert at Ethington Theatre, has something for everyone. The Ethington Dance Ensemble, under the guidance of GCU’s director of dance, Susannah Keita, has come a long way since its start a year ago. This production showcases that evolution, tackling several different styles of dance and combining them — sometimes even within one piece — smoothly and effortlessly. Thanks to the talented choreographers added to Keita’s staff this year and a program that is now 50 students strong, Thursday’s opening-night audience was shown a wide range of techniques and variations inspired by famous dancers and choreographers throughout history. 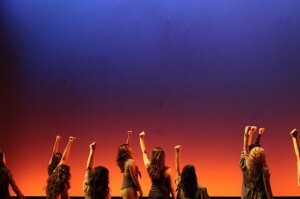 The opening piece, “Fight the Fire” by Ali Buckler, took inspiration from Sonya Tayeh, a judge and choreographer from the Fox TV series “So You Think You Can Dance.” The piece, performed by GCU’s dance line, was inspired by Tayeh’s “combat jazz” choreography, combining hip hop, jazz and modern dance to create a high-energy, powerful routine. A dramatically modern piece, “Outside (Inside),” was choreographed by Jessica Rajko and inspired by German dancer and choreographer Pina Bausch. Set to some funky music, the piece had a darkness to it, dealing with social acceptance and individuality. Inspiration from the famous co-founder of the New York City Ballet, George Balanchine, regarded as one of the foremost contemporary choreographers in the world of ballet, was showcased in a piece by Sonja Mitrovic, “See the Music, Hear the Dance.” Elaborating on the grace and elegance of classical ballet with clean lines and great flow, the piece touched on the contemporary side with a hint of modern dance added to the mix. Ending with a strong piece titled “Waters of Babylon,” choreographer Zari Le’on took inspiration from independent contemporary choreographer Ulysses Dove, whose work is famous for its speed and force. The dance was a fun and upbeat piece, again using a great combination of styles, drawing from modern dance and contemporary ballet and possessing a rhythmic feel. “Legacy” was rounded out with pieces inspired by Katherine Dunham (“Zuspitzen,” choreographed by Keita) and Merce Cunningham (“Intercession,” by student Antoinette Proctor). “Legacy” can be seen in a final performance at 7:30 tonight in Ethington Theatre. Tickets are $10. Call 639.8880 or email ethington@gcu.edu. Contact Jennifer Willis at 639.7383 or email Jennifer.willis@gcu.edu.